This is a large applique butterfly design. You may skip the applique part if you don’t want to do that and just sew the design directly onto a tote or tshirt etc. 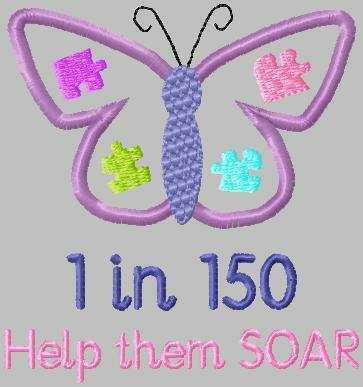 Alternately, you may also stitch the applique butterfly and omit the puzzle pieces. Enjoy. I too would very much like this design as I have a nephew who is austic. I would love to make something special for his mom, my sister. I too would like a copy of the butterfly. I have s few friends with austic children. They would just love this. Could you please let me know how to order it. Sharona, I am glad you like the buttefly design. I am currently redoing the design to avoid copyright issues and when it’s done, I will post it under free designs when it’s finished. Thanks for writing. How can I get this autism butterfly design? are available. Hope this helps.